This entry was posted in Mission Opportunities, The Clothes Closet on April 8, 2018 by Brittany Redden. Over 350 backpacks were given out through the Clothes Closet this week. A big THANKS to all of the support that we received! Have a great school year everyone! This entry was posted in In the Community, News, The Clothes Closet on August 21, 2016 by bwsladmin. On August 16, 2016 the Whitewater Community Clothes Closet will host their 5th Annual Back Pack Distribution Day from 8:30 AM to 7:00 PM. Back Packs will contain school supplies and they will again offer a selection of New Socks and Undies (Courtesy of First United Methodist Church). They will also have the Clothes Closet Open during those same hours. Be sure to pass the word to friends.. This entry was posted in In the Community, The Clothes Closet on July 21, 2016 by bwsladmin. Come and find formal clothing for all of your Spring events. Open to ALL. Everyone is welcome and everything is FREE. This entry was posted in News, The Clothes Closet on March 22, 2016 by bwsladmin. This entry was posted in Fundraiser, In the Community, The Clothes Closet on November 19, 2014 by Becky Milam. Back to school: Supplies and Clothes! Congregational United Church of Christ, 133 S. Franklin Street in Whitewater. Volver a la escuela: Suministros y Prendasde Vestir conduzca! This entry was posted in The Clothes Closet on August 5, 2014 by bwsladmin. PROM POSSIBLE —Many young women and men are unable to afford the formal wear expected to be worn at a high school prom. A special evented dubbed “Prom Possible” is being sponsored by The Clothes Closet in Whitewater to provide formal wear for free from 5 to 8 p.m. on two Wednesdays, April 9 and 23. Pictured above, organizers Nora Robers, Kay Robers and Emily Babcock hold some of the formal wear that will be available. — Daily Union photo by Chris Welch. WHITEWATER — A special event such as prom or awards night is a major milestone in high school students’ social lives, and they often wish to dress appropriately to reflect the formality of the evening. However, for many students and their families, the purchase of formal wear is simply an economic impossibility. It’s not like a fairy godmother is going to come along and just give away a taffeta and satin gown, right? 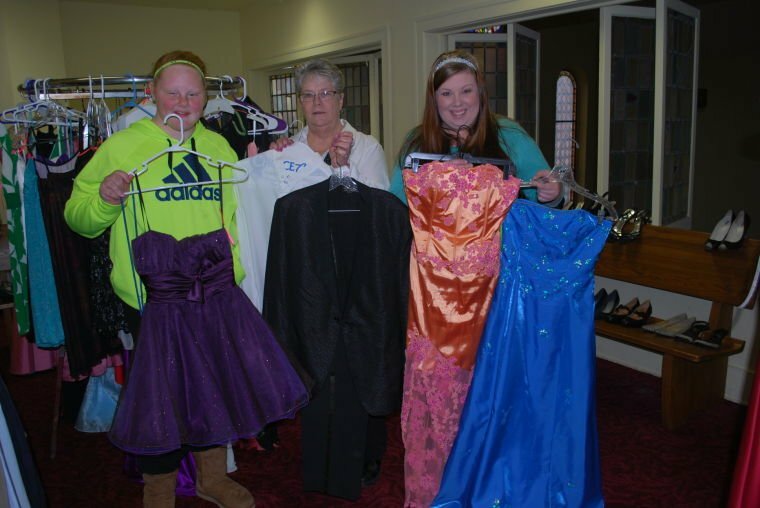 Well, spread the word: Fairy godmothers can be found in Whitewater during the “Prom Possible” event sponsored by The Clothes Closet, during which young men and women can obtain formal wear for free from 5 to 8 p.m. on two Wednesdays, April 9 and 23. The Clothes Closet is located at 133 S. Franklin St., on the second floor of the Whitewater Congregational United Church of Christ. Jointly operated by the Congregational UCC and neighboring United Methodist Church, it has been collecting clothing for distribution to anyone in need for more than 13 years. The Prom Possible event is filling a special niche as prom and graduation season approaches; however. It is being overseen by several volunteers, including church member Kaye Robers and University of Wisconsin-Whitewater student Emily Babcock. Babcock, originally from Pardeeville, said that two things got her involved in Prom Possible. About the same time that conversation took place, Babcock attended a Whitewater League of Women Voter’s meeting and heard Kay speaking about the Clothes Closet. Babcock said that when she was in high school, there were young ladies who could not afford formal wear, and attended prom in jeans. Babcock’s initial donation has grown much bigger than gowns from a pair of sisters. Robers and Babcock said they attended resident hall meetings on campus seeking donations, and they set out donation boxes in the halls. “I was explaining to one young lady on campus what we were doing with the dresses, and she almost broke down in tears,” Robers said. They have collected 74 dresses since they started Prom Possible. Prom Possible has clothes that are donated specifically for proms, but, Robers, Babcock and other volunteers sorted through the regular donations, as well, to find items that could be used in any formal setting, such as ties, shoes, jewelry, and purses. “We have everything you need to go to prom,” Robers said. Remember the fairy godmother mentioned earlier? It gets even better. “We will have someone here to do alterations on the nights we give the clothes away,” Robers said. Robers noted that the Clothes Closet has been at the Congregational UCC for a dozen years. “It started at the Methodist Church, but it became too big and they could not handle it anymore, so it came here,” she said. “It all started with a gentleman who was a janitor at one of the schools, and he started collecting winter coats for children who needed them. He collected them, then he distributed them through the schools. The Clothes Closet now more or less dominates the second floor in the Congregational Church. The normal schedule for the Clothes Closet is that it’s open on the first and third Saturday of every month from the third Saturday of August through the first Saturday in June. It’s closed for most of the summer months. “The reason for that is that it’s very hot upstairs, and it’s not air-conditioned,” Robers said. She added that during winter months, the Clothes Closet is open on Friday evening, as well. Robers said none of this would be possible without the “very, very generous donors” who give their gently used clothing to the Clothes Closet. Robers said that they still are accepting formal wear clothing for this year, and anything that does not get picked this year will be saved for next year’s prom season. Clothing can be dropped off at the Clothes Closet, or at a special bin set up at Daniels’ Sentry in Whitewater. For more information, contact Kay Robers at (262) 379-0187 or email at roberskay@yahoo.com. This entry was posted in The Clothes Closet on March 29, 2014 by bwsladmin. Local Girl Scout troop: 2332, is collecting POP TABS for the Ronald McDonald House. 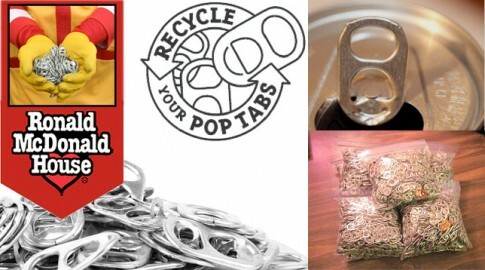 Please drop your pop tabs off at the Whitewater Clothes Closet. This entry was posted in The Clothes Closet on November 20, 2013 by bwsladmin.